I created this sheet when my year 11 students were doing a conversation activity with the year 12. There are 2 activities. The first one is a speed dating format, though instead of naming the topic, as I usually do, I provided the students with a guide to know what subtopics I was expecting them to discuss in their pairs and on the right side, which grammar focus they could think about while talking. I gave students 10 minutes to talk with their partner. We repeated this conversation with a different partner a second time. The second activity was a collaborative one. It addresses a new requirement in our Victorian study design, which has included a visual dimension to the traditional 4 macro-skills. We have not yet been given much detail about how this dimension will be assessed, so I try different things (previously I showed students infographics and asked them to write an essay as newspaper article). 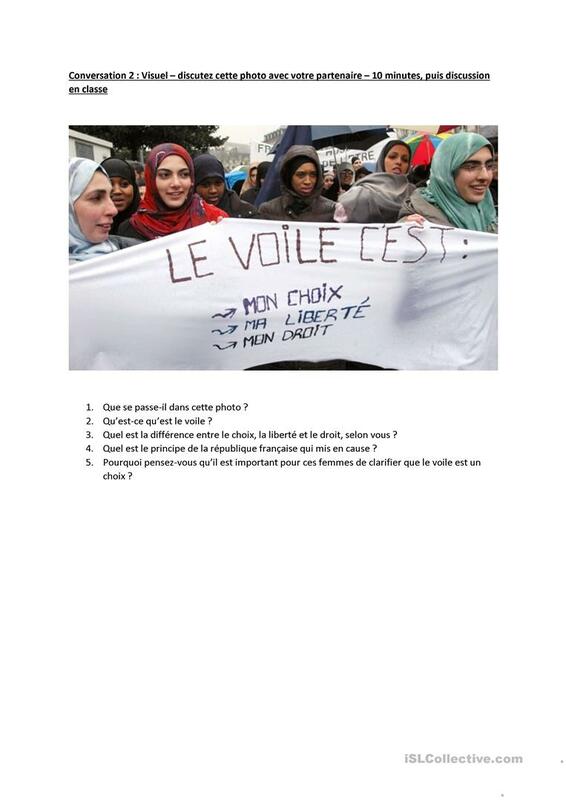 In this activity, small group of 2-4 students discussed the image, with my prompt questions as guide. They were given 5 minutes, after which a whole class discussion was held, focusing on cultural differences between France and Australia, and the topic of 'laicite' as a principle of French democracy. Olivierelzingre est de Australia et est membre d'iSLCollective depuis 2018-05-10 02:55:53. Olivierelzingre dernier connection sur 2019-04-13 09:44:41 et a partagé 2 de ressources sur iSLCollective jusqu'ici.